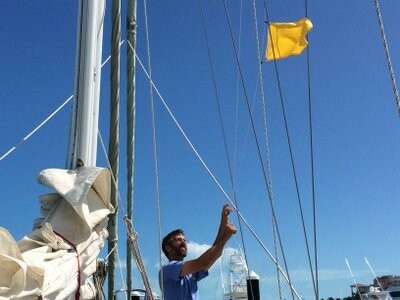 After we arrive at Blue Haven Resort & Marina, Matt raises the quarantine flag. The dockhands tell us they will get us when the customs and immigration officials arrive. I would like to fling myself on the dock and kiss the ground but we are not allowed off the boat until we are formally checked in by government officials. A few hours later a dockhand comes out in a golf cart to drive us to the office. The whole check-in process is very professional and feels like the U.S. There is no question that this is an ‘abide by the rules’ country and that there will be no bribery. What a relief. 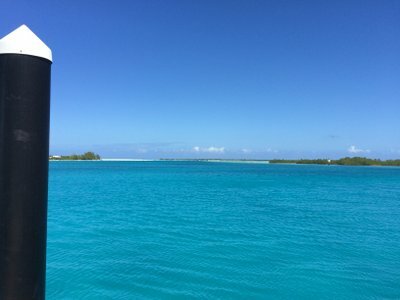 We buy the Turks & Caicos Islands (TCI) flag when we check into the marina. Then we shower to ‘wash off the sail’ (as Matt puts it) and decide to eat off the boat to celebrate. Malachi still feels terrible; he has a headache and won’t eat anything. Halfway through dinner, he leaves the table to lay on a nearby deck lounge. I take him back to the boat early and put him to bed while Matt and Joshua finish dinner. Once Joshua is in bed, I tell Matt I can’t wait to get a good night’s sleep. The view off the stern of the boat. I know, … surreal. At 10 pm, we’re woken by Joshua saying he feels sick. I usher him to the head where he vomits. I put him back to bed and give him a bucket. I get up to attend to him again at 12 am and then again at 3 am. He has nothing left to throw up but just keeps heaving. We wake up in the morning and everyone is sick – raging headaches, lightheadedness and nausea. I muster the will to take down the quarantine flag and raise the TCI flag, and then connect the electric cable to the dock. I have to stop every few minutes so I don’t pass out. The whole day passes with almost no movement. If there were an aerial interior view of the boat, all that would be seen is bodies dragging themselves to various places of repose. Berth-settee-table-berth. Malachi throws up again. At the pace we were going, we had an 85% chance of making it on time to meet Matt’s mom and sister in the Bahamas (Eleuthera). The need for boat repairs, plus our illness, now drops that likelihood to about 5%. Matt, never one to give up on a stated goal, finally waves the white flag. He calls his mom and she graciously understands. At least they will have good mother-daughter bonding time in a gorgeous place. In the early afternoon, Matt rouses himself enough to call a boat yard so we can get a sense of how extensive the repair will be. The owner of the business comes out to look at the rudder post and the autohelm. There is an easy way to do things and a right way to do things. Seldom are they the same but, in this case, we get lucky. It will not be a difficult or time-consuming repair and they can schedule it for early next week. As an aside, I will say that there are two kinds of boat owners: those who look for easy and cheap fixes (i.e., the duct tape breed) and those who do things right. Matt is of the latter variety. There are few things on this boat that have not been pulled apart and redone in the highest quality way. So … it seems that we will be staying here for at least a little while. I’m sure it’s not by chance that each overnight passage was more difficult than the last. Over the next two days, we find bruises on our bodies from being tossed around during the sail. This is a good place to land – there is potable water and it feels safe. The timing of things does not seem coincidental. Matt has been saying for weeks (maybe two months) that he just wants to stop and rest in one place. My one request was that we not be traveling on my birthday. So, although we thought this meant being in the Bahamas by then, it apparently means being in this haven for a while. The Universe always grants a request – just not in the way we think it will. The marina and resort are pretty damn near perfect. The color of the water and the views are incredible. 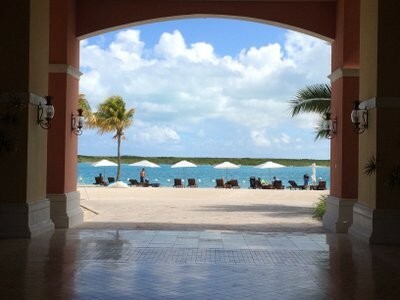 The marina has a nice restaurant and showers; the resort has a beautiful pool, outdoor lounge areas, a high-quality gourmet café and market, and lots of hammocks. 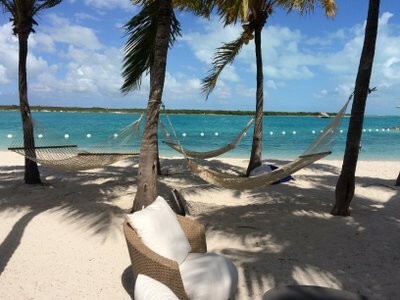 This whole trip I’ve just wanted to hang out in a hammock somewhere. I guess this is the place. Not bad. This entry was posted in Uncategorized on March 16, 2015 by Diane.